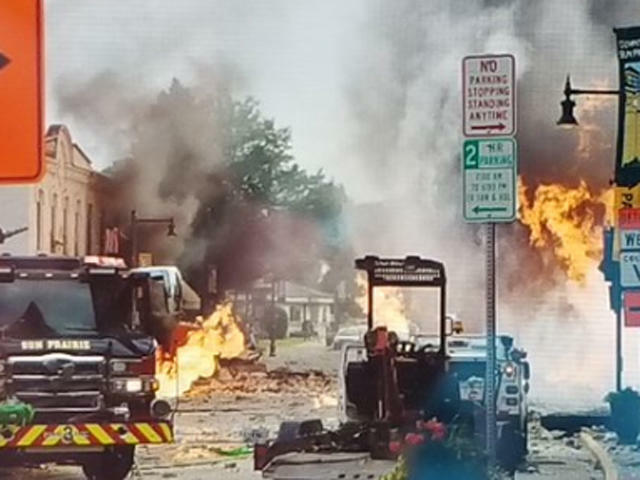 SUN PRAIRIE, Wis. -- A firefighter was killed and at least a dozen other people were injured when a natural gas explosion leveled at least two buildings in a Wisconsin community, authorities said Wednesday. A gas leak in downtown Sun Prairie led to the Tuesday evening explosion, which ignited a fire. Billowing smoke could be seen for miles. Another firefighter suffered critical injuries in the blast and his condition was later stabilized, according to Sun Prairie Police Lt. Kevin Konopacki. Four other firefighters, a police officer and seven civilians were also hurt, Konopacki said. The firefighter who died was with the department at least 10 years, Sun Prairie Fire Chief Christopher Garrison said. WE Energies spokeswoman Amy Jahns said workers for a private contractor punctured a 4-inch gas main, causing a leak that resulted in the explosion. The blast rained burning debris on downtown Sun Prairie and set vehicles parked nearby on fire. Authorities evacuated buildings within a half-mile radius from the center of the explosion. That evacuation area was still in place Wednesday morning, with more than 100 people out of their homes, reports CBS Madison affiliate WISC-TV. The Red Cross assisted evacuees at a shelter set up at Sun Prairie High School. Steve Owen, 60, who owns Sun City Cyclery and Skates in downtown Sun Prairie, said he saw firefighters and police officers on the street and then the explosion happened. He said the building across from his shop "literally lifted up." The force of the blast knocked him back in his chair and he ran outside and saw a ball of fire, he said. Patrick DePula, the owner and chef at Salvatore Tomato Pies, said he didn't sleep much on Tuesday night. "It's one of those moments where you take stock and it's like whatever damage happened to the building, whatever happened to the vehicles or personal property, it's so unbelievably unimportant compared to the loss of life" that could have happened, DePula said, WISC-TV reported. He said he doesn't know how his building is, but that he doesn't care. He also emphasized that Sun Prairie's Fire Department is a volunteer fire department. He said there are no braver people on the planet.